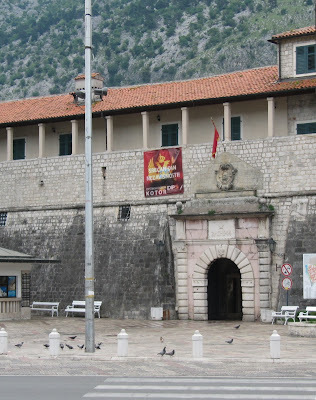 We stayed for four days by the sea in Kotor, a town Montenegrins call the pearl of Montenegro. It’s a tiny, charming town about an hours drive from Budva, a more famous settlement on the shore. Although it’s scenic and quaint, it’s basically built and fueled by tourism and three cruise ships had docked on one single day so the place was packed. It was only mid-May so I cannot imagine the high season. However it was more than tolerable, practically comforting at times because there were so many English speakers roaming about and all the various accents are quite fun to hear in passing. Plus with all the tourists scampering about shop owners and waiters normally used Serbian/Montenegrin to communicate because we could, unlike most of the other foreigners. Kotor has a magnificent view to the top of the fortress which requires climbing innumerable stairs positioned barely close enough to take one step per stair. Oh and I can’t believe it took me so long to get to this but it’s warm! It’s short sleeves and shorts time for the first time since September (Serbia had a colder fall than usual this year). Finally it’s summertime, Hawaii-time, comfortable-weather-24/7-time and it makes for a better atmosphere (bon mot unintended) for travel, relaxing, reflecting, and appreciating alfresco (Italy’s on my mind because I’m meeting my family there after the program is done!). The year-round Hawaii summer was missed tremendously and I’m glad it’s not going anywhere, well, until September at least when I’ll head back to higher latitudes. This is a Serbian Orthodox church in the middle of a town in Montenegro. 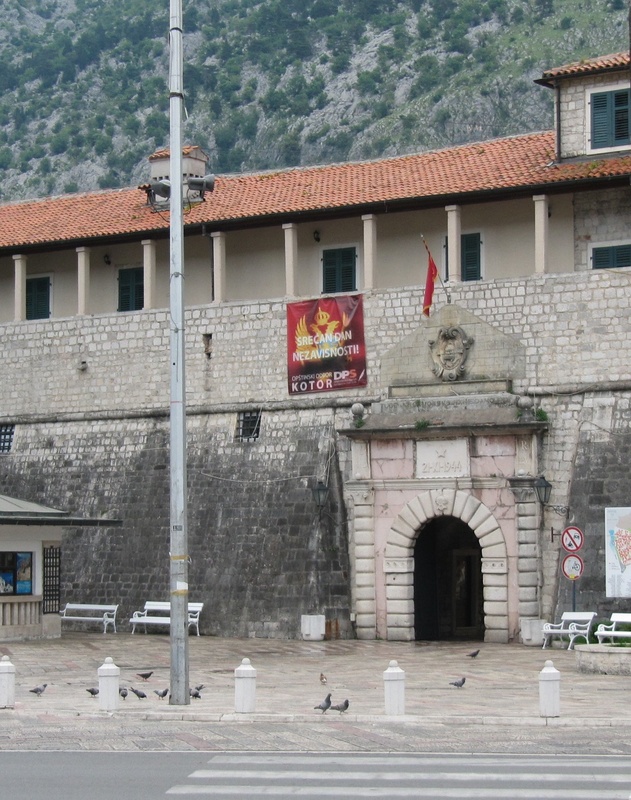 We’ve been told Montenegro doesn’t have as much of a religious following as Serbia. The four Cs (S in the Cyrillic alphabet) cornering the cross stand for "Samo Sloga Srbina Spasava" (only unity saves the Serbs). This symbol is graffiti-ed everywhere around Serbia – we saw it a handful places in Macedonia, Montenegro, and Croatia as well – by Serbian nationalists – and it’s also put on bread for Slavas (patron saints) and Orthodox holidays. Perest is a pedestrian-only neighborhood in Kotor and off the coast one can take a short ferry ride to this man-made island with an Orthodox church. Ceca’s friend lives in a 300-year-old house in a village on the outskirts of Kotor and we were lucky enough to be toured around their property. They said no one had renovated drastically since it was built, just the roof a couple of times and restoring chipped stones. This is one of three circular spaces on the property called guvno where your voice is magnified if you stand directly in the center. The villages would hold town meetings there and there was some sort of wheat grown or stored there.